My neighbor has a Meyer lemon tree. It's on a strip of land between our two driveways. It certainly belongs to her, but she allows me to freely harvest from my side of the tree, which is terrific. (By the way, I learned a lot about trees and the law in one of my classes last term; if your fruit tree hangs over into a neighbor's yard, that fruit still belongs to you and you can claim it. However, if you want to be a nice neighbor, you'll let them have it. :) ) I always make a batch of lemon curd and lemon bars. I always juice several dozen and then freeze that juice to have on hand through the year. Tom tends to make a batch of limoncello. And then I usually make a quart jar of preserved lemons, which I keep in the fridge, and then those are used for roasting chicken or sometimes fish, though preserved lemons are exceedingly salty (that's how they are preserved, in salt). This year, Tom bought me an Excalibur food dehydrator for my birthday, so I decided to dry lemon slices instead of making preserved lemons. I imagine these will be much more versatile, as I can take a few out every time I roast fish or chicken, or want a hit of acid in a soup. A slice can also be added to a water bottle, or to a cup of tea. They can be reconstituted and chopped up to be added to vinaigrette. There are dozens of ways these can be used. My dehydrator has nine trays. I filled those with about 40 sliced lemons, which made about 6 quarts of dried slices, enough for me and some to give away. I set the temperature at 135 and ran the machine for 12 hours, which yielded perfectly dry slices. And they look so pretty in the jar. Before I juice the next batch for the freezer, I think I will remove all the zest first, and then put it in the dehydrator. 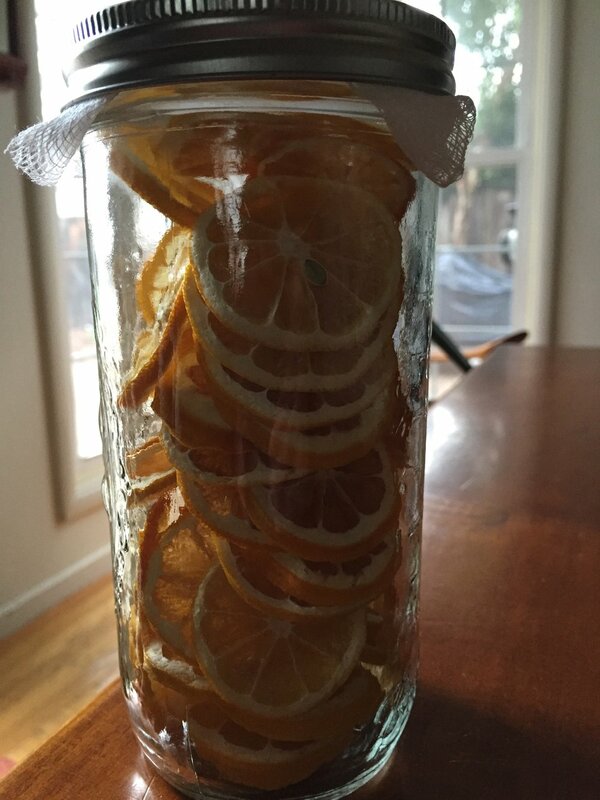 This way I will have dried zest to use all season and I'll never have to buy lemons. 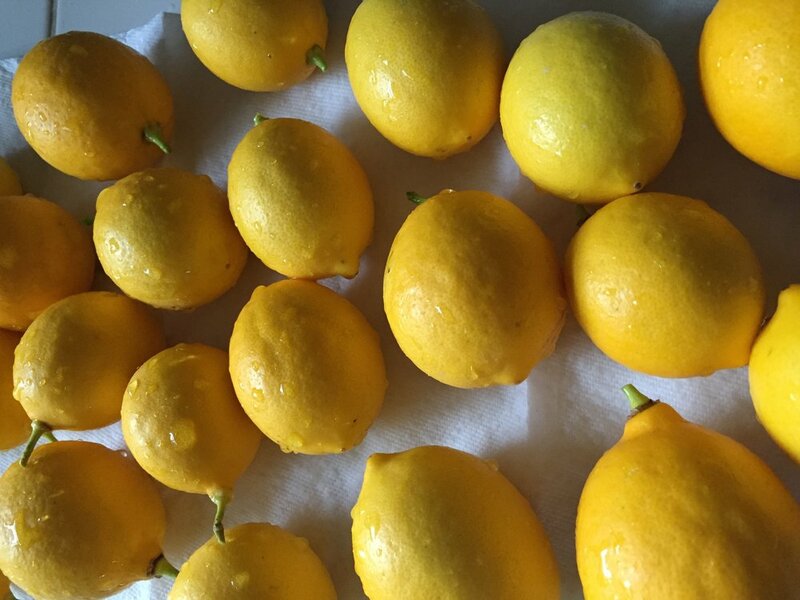 By the way, Meyer lemons are usually only available from December through May, while Eureka or Lisbon lemons are generally available all year long and are what you find in your grocery store. Meyer lemons are sweeter, thin-skinned, smaller, and darker than regular lemons, and have a sort of floral scent to them which is simply heavenly. There's a nice post on Kitchn that explains how to tell the difference, with pictures. 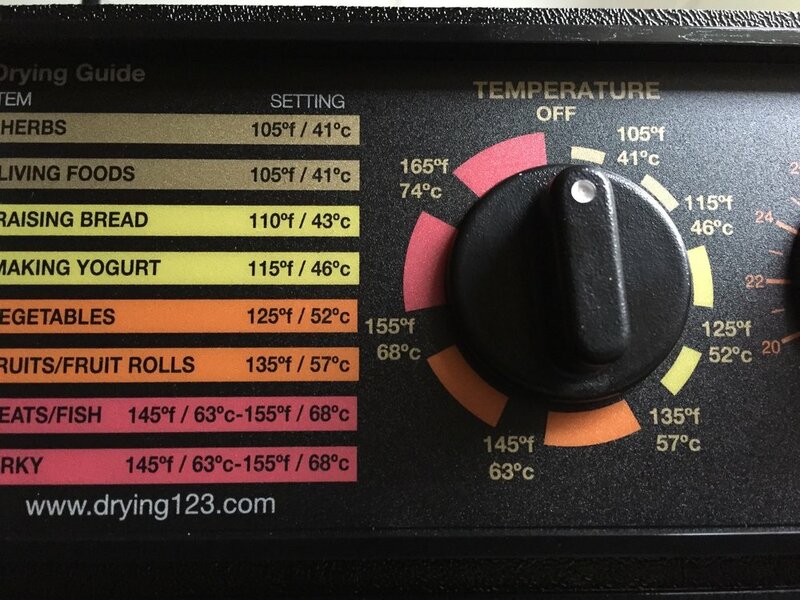 As always, I'd prefer to use what's available seasonally and preserve what I can for the time that fruit/veg is NOT in season, so this dehydrator is going to help me do that in myriad ways. I'm enjoying having some time off from school to manage these winter kitchen projects. I also re-decorated my homemade wreath for January - it was fun tramping through a local open space to find the different berries. This is a mix of olive, cotoneaster, toyon, and pyracantha. I'm thinking of all of you who live anywhere but the West coast, and wondering how you're managing your frigid weather. We finally have some rain, which is desperately needed, but our daytime temperatures in the 50's certainly feel balmy compared to what you're dealing with. I'm hoping that humans and animals are managing ok. Please check in and let us know how it's going in the comments.